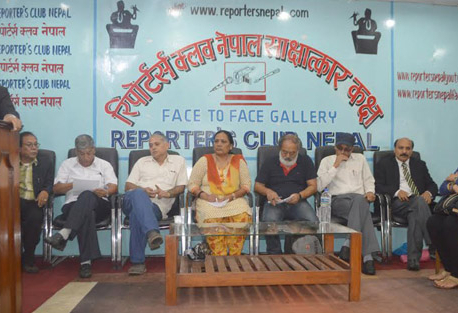 KATHMANDU, July 1: A group of human rights activists has urged the government to take necessary measures to save the life of Ganga Maya Adhikari, who has been on a hunger strike for the last 34 days demanding justice for her son murdered by the Maoists during the insurgency. On Sunday, a group of human rights activists including Arjun Narsingh KC of Nepali Congress reached Bir Hospital to take stock of Ganga Maya’s condition. The hospital informed the rights activists that her condition has become critical due to low blood pressure and infection in her throat. Two days ago, Ganga Maya was transferred to the ICU of the hospital after her health condition became critical. “We were told that her condition has become critical. We urge the government to act and save her life before her condition deteriorates further,” Charan Prasai, a human rights activist, told Republica. He said that he has asked Law Minister Sher Bahadur Tamang, Foreign Minister Pradeep Kumar Gyawali and Subas Chandra Nembang, deputy parliamentary party leader of the ruling Nepal Communist Party, to inform the prime minister about Ganga Maya’s deteriorating condition and urge him to act immediately to save her life. “Prime Minister Oli and Home Minister Ram Bahadur Thapa will be held responsible if Ganga Maya loses her life just like her husband. By remaining silent over her demands, the government is promoting systemic impunity for those involved in serious crimes during the Maoist insurgency,” Prasai said. Earlier, the government had promised to implement the Supreme Court verdict to jail Chhabi Lal Paudel, who has been charged with murdering Ganga Maya’s son Krishna Prasad during the Maoist insurgency on June 6, 2004, on the day the prime minister flew to China on June 19, according to Prasai. “But bowing to pressure from leaders of the then CPN (Maoist Center), Prime Minister Oli flew to China without implementing the court verdict. We urge the government to act immediately,” Prasai said. She along with her husband, Nanda Prasad Adhikari (who breathed his last on September 22, 2014 in the course of his hunger strike with the same demand) launched a number of hunger strikes in the past. They had first begun a hunger strike in front of prime minister’s official residence in Baluwatar in January 2013. They were not heard. Then they started their second hunger strike in the following month and ended it on the 47th day after an agreement with the government, which assured action against the suspects. But the suspects were later released. Nanda Prasad’s body is still at the Maharajgunj-based Tribhuvan University Teaching Hospital. The Adhikari family has refused to receive the body until they get justice.